ey guys today we are going to take a look at Acer Iconia W510. It is a Windows 8-based tablet and what’s important to point out is that it is running the full version of the Windows 8. Let’s step into the world of hybrids that struggle to make both work and entertainment flexible and pleasant. The design meaning the components very much remind of Samsung ATIV Smart PC. You have a tablet where everything happens and all the data is stored and then you have a keypad docking station. But the difference is that the Iconia W510 is really a great deal in terms of specifications and price. The W510 accommodates a pretty good screen – it comes with a 10.1-inch IPS screen at the resolution of 1366×768 pixels. It features a Cine Crystal technology. The Gorilla Glass 2 is scratch-resistant and very durable. The brightness of the screen is 262 lux which falls behind what most competition tablets offer, but not to forget here the cost is lower. Battery life is this machine’s strong suit. The 2-cell lithium-polymer battery has 3650 mAh capacity. Surfing on Wi-Fi and watching videos online drained the battery in around 9 hours, which is an excellent result. When you add the dock battery unit the battery life increased up to 15 hours of playback and browsing. This device can easily make it through a whole day of play. Looking inside the tablet we were surprised to find an Atom processor inside. More specifically this Acer machine runs a dual-core Intel Atom processor at 1.8GHz also called Clover trail. 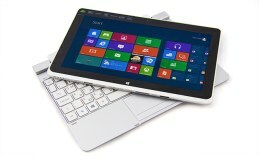 It is the next generation Intel Atom chip that we are going to see in many Windows 8 tablets and laptops as well. The system memory on the Iconia W510 is 2GB. The tablet docks into a keyboard pretty easy. It rotates 295 degrees which gives you the flexibility to adjust it to the most comfortable position for example to watch videos or share a presentation. The interesting part is that it is an Atom-based machine which is something we haven’t seen in a while. The case has a plastic back and also has a nice distinctive white bezel that goes around the screen. The weight of the tablet only is 1.2 pounds, while the whole construction with the keyboard weighs around 2.8 pounds. However, the lack of balance causes the construction to flop backwards from your lap if you increase the angle of the display too much. But this is a common phenomenon with such hybrids. This was the case with Asus Vivo Tab RT as well. The flash memory capacity on board is either 32GB or 64GB and is expandable through the micro SD card slot. The connectivity options include micro HDMI and a micro USB ports. The keyboard dock provides a full-size 2.0 port. The 8MP back camera takes decent shots and also shoots video in FullHD resolution, it is facilitated by a flash. The front optics work at 2.1MP and also captures video in FullHD. However, both cameras experience difficulties when working in low-light. Acer Iconia W510 is a well-performing Windows 8 hybrid that is a flexible work and fun machine.